In automotive terms, Spain had never a major player. During the early days of the automobile, the country’s economy was too weak to keep up with its neighbors. Even worse still, Spain entered into a bloody civil war in 1936, which would devastate the country. From the ashes of the revolution, authoritarian dictator Francisco Franco and his totalitarian Falange party rose to power. The 1953 SEAT 1400, Spain's first people's car. The economy suddenly boomed in 1959, and the SEAT 600 became a symbol of the “Spanish Miracle“ of prosperity. All the while SEAT kept making Fiat copies, but with the death of Franco in 1978, the company saw a brave new world open up. Protectionist policies against foreign automakers were being dissolved to encourage a more open market, which left SEAT in desperate need to identify itself. A dispute between the Spanish government and Fiat saw the Italian firm drop out of the partnership in 1982, leading to SEAT having to fend for itself for the very first time. The Spaniards responded by releasing the Ronda, a heavily modified Fiat Ritmo (Strada). This move netted them a lawsuit from Fiat, but SEAT was able to prove the car’s differed enough to make their model legitimate. In 1984, they followed it up with the first locally developed SEAT, the Ibiza. The 1984 SEAT Ibiza represented a giant quantum leap for the company. The Ibiza was a small hatchback in the vein of the Fiat Uno and Volkswagen Polo, with some interesting names involved with its conception. German engineering specialists Porsche had a hand in designing the car’s drivetrain, and Giorgetto Guigiaro’s Italdesign penned the svelte body, which was actually intended as the second generation of the Volkswagen Golf. Last but not least, German coachbuilders Karmann readied the new bodyshell for mass-production. For its day, the Ibiza was an attractive little car. It’s marketing appeal was further bolstered by the System Porsche tags on the engine. These hadn’t come for free however, as Porsche charged 7 Deutsche Mark per car to SEAT in royalties. Helped by the expertise of the three famous companies, the Ibiza became an instant smash hit. The modified 125 horsepower System Porsche engine. Still high on the success of the Ibiza, SEAT decided to improve the brand’s image even further by entering the wild world of motorsport. If the Ibiza could prove itself on the world stage, there was no telling where the future would take the fledgling company. Sensibly, SEAT picked rallying as to serve as the stage to SEAT’s engineering prowess. In an effort to systematically increase their involvement in the sport, motor racing division SEAT Sport was created in 1985. The Spanish outfit raced mildly modified versions of the most powerful Ibiza, which eventually morphed in the Campeonato SEAT Ibiza de Rallies one make-series. Meanwhile, two entrepreneurial brothers were busing designing their own little rally special. At the time, four wheel drive an massive amounts of power were all the rage, as the ludicrous Group B category was reaching its peak. To the brothers Seriva, this was the ultimate dream. Sadly though, they had nowhere near the funds to afford the highly advanced turbocharged engines and intricate four wheel drive systems which dominated the rallying scene. Regardless of this fact, the brothers wanted to build the best possible rally car their modest budget would allow. The two settled on the new SEAT Ibiza as a base, and managed to tune its lackluster carbureted 1.5L System Porsche four cylinder from 90 to 125 horsepower using very conventional means. This was about a third of the power of the leading Group B monsters, so a solution had to be found to make the wimpy engine perform even better. The dim-witted engine simply wouldn't give more than 125 horsepower. The Seriva brother’s solution was as stupidly simple as it was brilliant. Even though there was no way their tiny naturally aspirated engine would make anywhere near the required power, they still considered four wheel drive an essential element of the new car. Together with their trusted mechanic, the brothers hit two birds with one stone by cutting two Ibiza’s in half, and joining their front sections together. After linking everything up, they were left with a twin-engined four wheel drive missile. With two modified System Porsche engines, the grand total was 250 horsepower. The two engines added up to 2922cc in total, which would have put the Ibiza in a favorable weight class in Group B. The siamesed chassis was then clothed in an unassuming standard body. To keep the weight down, the hood, rear hatch and wheel arch extensions were made out of lightweight fiberglass. In all the tiny challenger weighed just 1001 kg (2206 lbs). With the Spanish economy beginning to falter again, and political unrest rearing its ugly head, SEAT was in a difficult position. The company really wanted to enter the top level of rallying, but lacked the financial resources to do so. Unfortunately the DIY-nature of the Ibiza Bimotor caused its own unique set of problems. For starters, two separate drivetrains were incredibly difficult to synchronize. Due to the laws of inertia, the forward engine was always turning vastly more revs than the rearward example, which hampered performance. Furthermore, the process of properly linking up the two five-speed manual transmission proved to be a major headache for the Seat Sport team. Lastly the issue of adequately cooling the rearward engine was solved by placing a radiator in front of it, which was fed by two giant air-ducts breathing through large openings in the side windows. The large scoops in the side windows were essential to keep the rear engine cool. As ambitious as the Ibiza Bimotor project was, it was never really intended to directly compete with the immense firepower of Peugeot, Lancia and Audi in the Group B category. Instead, the Ibiza would take part in the recently announced Group S category. This new formula would allow prototypes which had only been built ten times, and eventually restricted maximum allowable horsepower to around 300. With top speeds, outright power and aerodynamic efficiency on the rise in Group B, Group S was called in to put a stop to the escalating performance and accompanying danger which Group B presented. The Ibiza never really got a chance to show its talent on the world stage. In this new environment, the Ibiza would possible stand an actual fighting chance. Sadly though, the tragic deaths of Lancia driver Henri Toivonen and his navigator Sergio Cresto at the 1986 Tour de Course sealed Group B’s fate. In the aftermath of the incident, and fueled by the tragedy with Joaquim Santos at the Rally de Portugal two months before, FISA-president Jean-Marie Balestra declared a ban on Group B which would take effect in 1987. Group S was dragged down with it, and Group A became the de facto top category in the World Rally Championship. Following this shocking development, SEAT suddenly had nowhere to race their promising prototype. The car was still being heavily tested during this time, which made it too little too late to compete on the world’s most challenging stages.Not willing to let their investment go to waste, SEAT Sport entered the exiled machine in the Spanish National Gravel Rally Championship. The car competed there for two full years, but never achieved the competitive level the Spaniards were so desperately hoping for, despite the arrival of a 150x2 300 horsepower evolution version of the car. By this time German automotive leviathan Volkswagen had taken a controlling interest in SEAT since gaining several manufacturing contracts in the early part of the decade, which shifted the company’s priorities massively. The project was cancelled at the end of the 1988 season, as SEAT turned their attention to Rally Raid racing. 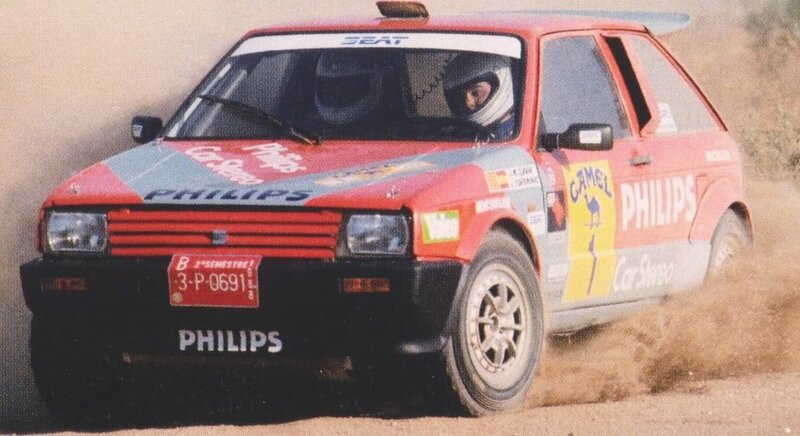 The SEAT Ibiza Bimotor was a budget version of the most powerful rally cars ever seen. Built by two incredibly ambitious brothers, the Bimotor gained official SEAT sponsorship and set out on a mission to improve the brand’s image to an amazing degree. Sadly the car was denied a chance to prove itself, as the escalating speeds in Group B finally took their horrifying toll. With the tragic deaths of Henri Toivonen and Sergio Cresto, both Group B and Group S were nullified in the interests of safety. Although a wise decision in the end, it robbed SEAT of its one chance to be in the spotlight on its own legs.